As a biologist interested in animal intelligence, I have had a long-standing fascination with crows and ravens (members of the corvid family, which also includes jays, magpies, and their kin). Nicknamed “feathered apes” because of their renowned ingenuity, these birds use and manufacture tools, show forethought and empathy, understand physics, are notoriously playful even with other species, and recognize individual humans as friends or foe for many years, passing this information down from one generation to the next. Their social structure resonates with us: they tend to pair-bond for life, they form close-knit family units where the young ones may remain with their parents for years and help raise younger siblings, and they develop strong long-term friendships with others. Their loquaciousness and superb vocal mimicry abilities are integral to the rich tapestry of their social interactions (Wonderful reads: Gifts of the Crow: How Perception, Emotion and Thought Allow Smart Birds to Behave Like Humans, by John Marzluff and Tony Angell, and Mind of the Raven: Investigations and Adventures with Wolf-Birds, by Bernd Heinrich). East Vancouver is under the flight-path of thousands of crows that return to their Still Creek roost in Burnaby every evening – I often climb to the roof-top of my little attic apartment to watch them fly by. Trout Lake, an urban lake situated at the heart of East Vancouver, is not only a pit stop for the roost-bound birds in the late afternoons, but is also a year-round daily foraging area for many of the birds, and a summer nesting haven for some crow family groups that established their nesting territories in the area. 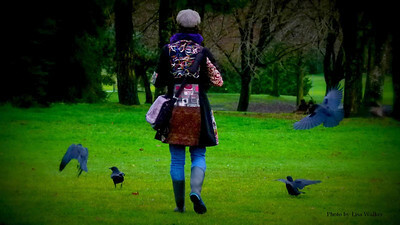 I have been photographing the crows of Trout Lake since the fall of 2012. I confess: I befriended them through treats. I occasionally brought walnuts or shelled peanuts, placing them in particular strategic locations around the lake - a hollow log, a big tree branch, a wood-fence - as the crows watched. To my delight, the crows not only soon learned to recognize my appearance, flying over to me as soon as they spotted me (and my little dog) anywhere in the park, but they also now come to me when they hear my whistle – a special whistle I use to call my dog, which inadvertently became a crow-calling whistle. They follow us on our walk around the lake, and they clearly remember where I have put treats for them in the past, flying ahead to the selected locations and waiting for me there. The beauty of my treat-provisioning strategy (admittedly a controversial practice, but tremendously fun and rewarding!) is that I soon got the crows to trust me, allowing me to sit amongst them (treat-less) and watch them go about their lives. I was able to observe many captivating details of their behavior, and found myself looking for opportunities to photograph those details. My nearly daily excursions into the world of my feathered friends became an ongoing project. I hope that these images capture a little bit of the "spirit" of these stunningly beautiful, sociable, intelligent beings.